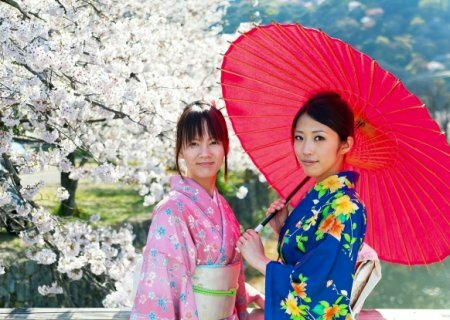 number of examples of places and events that you can enjoy for free in Japan. Imperial Palace East Garden ʢߖډ౦ޚԓʣ, 3-min. walk from Takebashi Sta. on Tozai Line, or 7-min. walk from Otemachi Sta. on Chiyoda, Mita, Hanzomon and Marunouchi Line, is a garden adjoining the Imperial Palace and a museum. The garden of 210,000 m2 first opened to the public in 1968. Here you can enjoy cherry blossoms and azaleas in spring, various roses in early summer, and camellias in winter. Open: 9:00–17:00 (Apr. 15–Aug.) 9:00–16:30 (Mar.–Apr.14, Sep.–Oct. ), 9:00–16:00 (Nov.–Feb. ): enter 30 min. before closing time. Closed: Mon. 9:00–15:45 (Nov–Feb. ): enter 15 min. before closing time. the following day. ), Dec. 29–31 & Jan. 2–3. Tel: 03-5320-7890. Everyay (Jul. & Aug.). 12:00–16:00. Tel: 03-5608-6951.